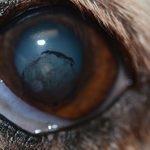 An 11- year-old castrated male Boxer cross presented to the referring veterinarian with a four-day history of vomiting once per day, which was very unusual for him. The owners had also noticed that his abdomen appeared mildly distended over a two-week period. On physical examination at the referring veterinarian’s hospital, the abdomen was difficult to palpate, but did feel firmly distended. The physical examination was otherwise normal. 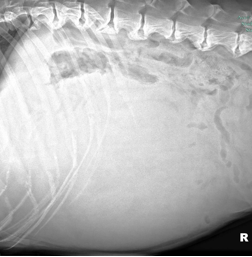 The referring veterinarian obtained a lateral abdominal radiograph (below). Question: What abnormalities are present? There is a large abdominal mass in the mid-ventral abdomen. Intestinal serosal detail is good, suggesting an absence of abdominal effusion. The small and large intestines are displaced dorsally. Liver margins are not well-visualized. Based on the direction of intestinal displacement, a splenic mass is most likely, although a liver mass cannot be ruled out. Question: What are the rule-outs for this splenic mass? Answer: The 2 most likely rule-outs are hemangiosarcoma (HSA) and hematoma. Other rule-outs include more rare splenic malignancies such as leiomysoarcoma, fibroscoma and lymphoma (which can occasionally present as a splenic mass rather than generalized splenomegaly); and other benign lesions such as lymphoid hyperplasia. Question: In discussing the possibility of splenectomy with the owner, how would you characterize the chances that this mass is HSA? Answer: While HSA is the most likely diagnosis, there is a reasonable probability that the mass could be benign. The 2/3, 2/3 rule is fairly reliable: 2/3 of all splenic masses are malignant, and of those, 2/3 are HSA. Approximately 70% of dogs with a splenic mass and hemoabdomen have HSA, (Pintar, JAAHA, 2003) which means that 30% of dogs with this presentation have other diagnoses! The larger a splenic mass, the more likely it is to be benign (Mallinkrodt, JAVMA, 2011), although there is no single point at which a mass can safely be considered “large”. While the absence of hemoabdomen did lower the probability that the mass in this case was malignant, in one study, 56% of dogs with benign masses presented with hemoabdomen. (Mallinkrodt, JAVMA, 2011). 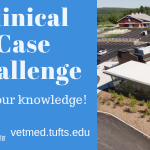 At Tufts, we are in the process of developing a scoring system that will allow veterinarians to more accurately predict the probability that a given splenic mass is malignant. Large breed dogs with splenic masses should never be euthanized under the presumption that the mass is HSA, unless gross metastatic disease can be demonstrated. Although the liver is the most common site of HSA metastases, metastatic liver nodules cannot be definitively distinguished from hyperplastic nodules with ultrasound. Based on the possibility that the mass could be malignant, the owners elected splenectomy. The mass was removed by ligating at 3 points: the splenic artery and vein as they emerged from the area dorsal to the stomach, the left gastroepiploic artery and vein, and the short gastric arteries and veins. This is an efficient way to do a splenectomy, and does not risk necrosis of the greater curvature of the stomach because of the collateral circulation provided by the right gastroepiploic artery and vein. The photograph below shows the gross appearance of the mass during surgery. Question: Does the gross appearance of the mass suggest any particular histologic diagnosis? Answer: No. HSA and hematoma remain the primary rule-outs. The patient recovered uneventfully from surgery, and was discharged the next day. Three days later, the histopathologic report came back hematoma. Question: What is the prognosis? Answer: If the mass was truly a hematoma, the patient should be cured. However, when large mass lesions are sectioned for histopathology, only a small number of sections ,4 to 5 in most labs are taken. In the case of splenic HSA, the majority of the mass may be hematoma, and the inciting HSA may be missed during sectioning. So, in large breed dogs with splenic masses, a diagnosis of hematoma is always slightly suspicious, particularly when there is hemoabdomen. 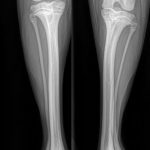 The owners should understand that while the diagnosis is overwhelmingly likely to be correct, there remains a small chance that the lesion was actually a HSA. Question: Why do splenic hematomas form? Answer: Dogs with splenic hematomas usually do not have an identifiable underlying systemic cause such as trauma or a coagulopathy. There is good evidence that hematomas are caused by spontaneous hemorrhage inside nodules of lymphoid hyperplasia, as shown in the histopathology slide below. Question: What would the prognosis have been if the mass had been HSA, and how would clinical stage have affected the prognosis? Question: Is survival time of dogs with HSA prolonged by chemotherapy? Probably. Several uncontrolled studies in small numbers of dogs have suggested some prolongation of survival in dogs receiving chemotherapy as compared to historical control dogs treated with splenectomy alone. 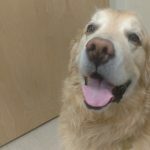 A recent review of 54 dogs treated at Tufts with doxorubicin-based conventional chemotherapy and/or metronomic chemotherapy (i.e., at home, oral, low-dose chemotherapy) showed a statistically significant improvement in survival when survival times were compared to those of the splenectomy-alone dogs described above. However, the improvement was not dramatic, and much work remains to be done to optimize chemotherapy protocols for this extremely aggressive form of cancer in dogs. The dog with a splenic hematoma described above is now 2 years beyond surgery, and doing well.